Alright episode. It's been a while since Tsuda Kanji was a guest star in toku, I've missed that guy. Wish he had a bigger part. The hints of things to come with Chekov's upgrade watch and mirror Sougo is interesting. It has potential, I'll say that much. Of course, P-Bandai announces a Mirror World Watch pack featuring the new Watches from this episode. Good that Heure's bringing his A game on MOTW creation. Another Ryuga is a challenge just as Another Ghost was. Geiz, screw destiny. Do not take the challenge. Let your target take care of the obstacle. Good episode. I hope that Kanzaki drawing could be available as a wallpaper. I got a serious nostalgic rush just from that screechy sound effect and that visual in the first few minutes reminiscent of Ryuki's opening. As for the episode itself, it's pretty cool. Another Ryuga is maybe my favourite-looking Another Rider so far, and that he's actually Ryuga is pretty interesting. I also like how just about every one of our main characters right now has their own individual agenda. Shinji didn't get to do much, though his actor is also technically playing double duty as his mirror self I suppose. I am sure that we still won't see much of the actor next week too, but somehow I didn't feel too bad. Maybe it's because I was expecting that going into the episode. The fact that he showed up at all is pretty cool, and he is already playing more of a part then Kouta and Kaito did back in the Gaim episodes. Also I think I really love Mirror Zi-O for all the wrong reasons. He's really goofy in how evil he is. They could have gone with a more silent and stoic performance kinda like Ryuga from Episode Final, but I vastly prefer this for entertainment value even if his intimidation factor might not all be there. I also like that his design is literally a mirrored version of the hero. They could have gotten away with a black palette swap but I find this approach more interesting, though probably only because the riders in this show have big bold words written on their faces. Only missed opportunity is that his belt and watch's sound effects are just this demonic version of Zi-O's sounds instead of being the same sounds played backwards. I know that probably would have sounded terrible, but you committed this much to the mirror gimmick so you might as well go all the way! Last edited by BreadToku on Thu Feb 07, 2019 6:27 am, edited 1 time in total. is that the same jacket wore by build's cast before in the picture? Damn. I'm really loving Zi-O at the moment. It goes from being the worst rider show for me(ep1-6) to being a contender for my top 10 best kamen rider show. in just 21 episode. I guess changing the director and maybe the writer(?) really does wonder. The way they make another rider is just SUBARASHI this past few week. Maybe i am minority but i am in Geiz side as Kamen Rider Zi-O remind me of Ryuki. Sougo(Shinji) Geiz(Ren) Tsukoyomi(Yui). Ren in my favourite in Ryuki and He won at the end. So, i'm hoping that Geiz can follow his father footstep. -Apparently, The Time Jackers have the ability to rewind time as well. -Shinji tried to kill himself. For anybody that doesn’t know, Charcoal-burning suicide is suicide by burning charcoal in a closed room or area. Death occurs by carbon monoxide poisoning. 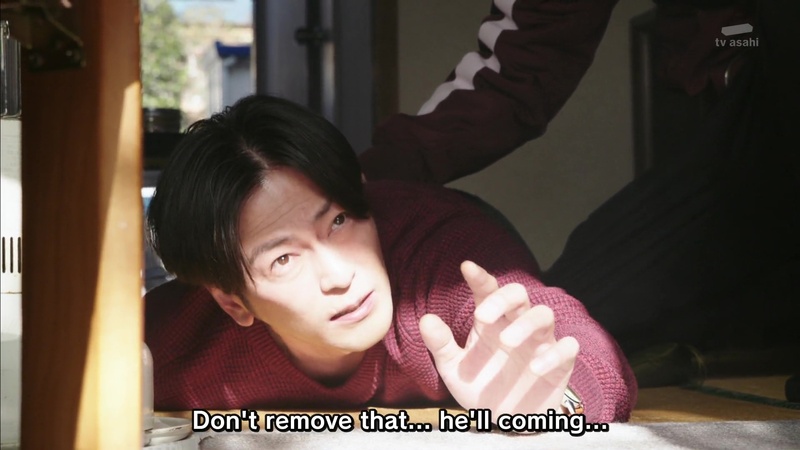 -Geiz sacrificing his life to defeat Another Ryuga might be strange at first glance, but remember, his main objective his to prevent Sougo from becoming Oma Zi-O, but he’s ready to risk his life to prevent Another Ryuga from causing more casualty, that shows how much Geiz trust Sougo now. Huh, do you really think the implication is that Shinji tried to kill himself? That seems weirdly dark, and sort of out of place considering it's not touched upon or mentioned. I just figured that he shut all his windows and didn't realize he put himself in a dangerous position. Early Heisei series is usually dark. ryuki is considered one of the darkest(kuuga is still the darkest). I don't know why they don't touched it either. My guess is to not give a reason for parent backlash. Implied is ok but you can't directly said/show it. One of the reason there is barely little to no civilian death in the beginning of the series. From Kuugo to Decade, monster still kill civilian. Starting Fourza, we barely see it. I don't know whether it's correct or not though. "Heel" Sougo >> "Baby face" Sougo. For some actors being the villain just suits them better. But Shinji doesn't necessarily seem suicidal once he's rescued. If that's the case, the actions seem undermotivated? He covers up the mirrors because he's scared of his mirror self, but if he's afraid for his life, why commit suicide? That theory just doesn't add up to me. This is just my assumption. It's been nearly 20 years since the event of Episode Final. Maybe, Shinji is sick of getting afraid and want to end everything. I am just speculating based on what i once or twice saw in drama. Hopefully, i am wrong as you said "the actions seem undermotivated?". Oh, so they're actually acknowledging that Ryuga was from the AU of Episode Final? That's surprisingly competent writing from this show. Pretty average episode to be honest. Cameos were kind of lame. I wish the power up arcs had higher stakes like they used to in older series. Oh yeah, QC made a recommendation and I didn't notice that the whole sentence had to be modified around it. I actually had the V2 ready, but forgot to push it out during lunch. Speaking of which, incoming V2! What makes Kuuga the darkest series? Sure they show the MOTW kill an innocent person, but other series did that too (like Agito). Most of the darkness is implied (I remember stuff like a reporter saying how many people died, but the show not actually showing much of it).